I never ate one of these until it was offered at the Ananda Yoga Center. Since then, I can't get enough. I have some every morning with my yogurt. I once tried finding some in Japan, but all I came across was some very expensive juice. They supposedly have positive effects on heart disease and high blood pressure. The name "apple seed" is a literal translation of the Latin. 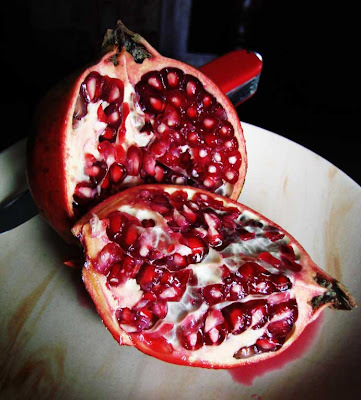 In Nepal they are called "anar," a word borrowed from Persia, where the fruit is thought to have originated. why it's a pomegranate silly! actually you can find these in Japan....almost every winter they are in the stores. I think the Japanese word is "zakuro"
Jeffy, I am pondering a return to the US....yep. As I recall, you not infrequently pondered such. Yes I have pondered this for better than a year now. Looks like I am making actual strides this time though. On the 13th I will be going to NJ for a test for the nuke plant job I once spoke to you about in the fall of 2007. If it works out, I will be making the move. Honestly a little unsettling (literally and figuratively) but when i do a pros vs cons I find the pros winning out for us all. Wish me luck, or fate, on the test. Looking forward to visiting Jersey and front-row Springsteen tix. I'll light a candle for you at the Stupa. Maybe I can convince a monk to say a prayer.